Mississippi State University partners with the campus bookstore to create a practical classroom. There’s so much talk about teaching “outside of the box” that it’s almost become a cliché, so when Charles Freeman, Jr., PhD., began planning his Visual Merchandising class syllabus last fall, he got an idea. Why not teach outside of the classroom? That’s when the Assistant Professor of Apparel, Textiles and Merchandising at Mississippi State University approached the campus bookstore to see if there was a way the two could work together to make his vision of teaching a class with a more practical side a reality. Along with Barnes & Noble at Mississippi State University General Manager Cecelia “Cecy” Brooks, the two created a hands-on retail learning experience that centered on using the bookstore as an experiential classroom so students could gain practical merchandising skills and retail experience. 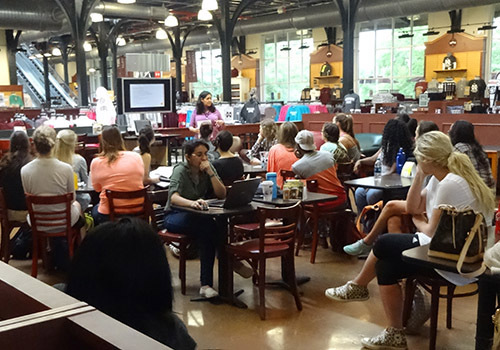 Students from MSU’s Visual Merchandising course attend class in the campus bookstore. Eager for his students to put theory to practice, Freeman turned to the campus bookstore for a teaching opportunity. 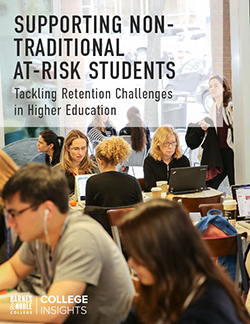 “I’m always looking for students to get hands-on learning, and by utilizing the bookstore as a kind of academic lab, we provided an opportunity for students to learn in a controlled setting,” he explains. Students were expected to treat the practicum like a job by dressing professionally, wearing name tags and embracing the experience. They were required to present their visual merchandising knowledge and skills to the class, explaining how and why items were selected for their tables, along with information on the clothing they selected for their mannequins. 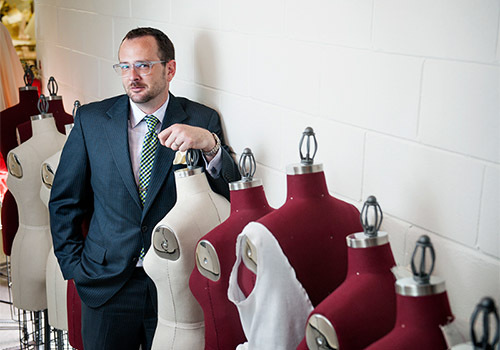 Charles Freeman, Jr., PhD., is the Assistant Professor of Apparel, Textiles and Merchandising at Mississippi State University. Equally important to Freeman was preparing students for careers in retail once they graduated. 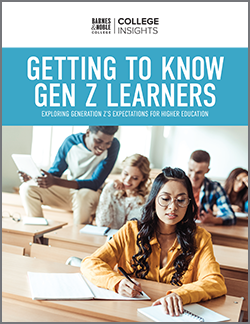 By requiring students to present in front of the class during evaluations, they would also gain valuable experience improving their communication skills, which is critical for a career in any industry. Students were graded not only on participation, but also on their level of professionalism, which included showing up on time. “We wanted them to learn what it means to be a professional — as well as learning merchandising skills,” says Freeman. Professor Freeman recognized the bookstore as a great resource for more than just textbooks. The store was not only conveniently located for the students, but it also offered a more practical size where they could learn. “The space gave students interested in a career in merchandising a chance to experience a macro version of the retail world within a smaller, more manageable space,” said Freeman. 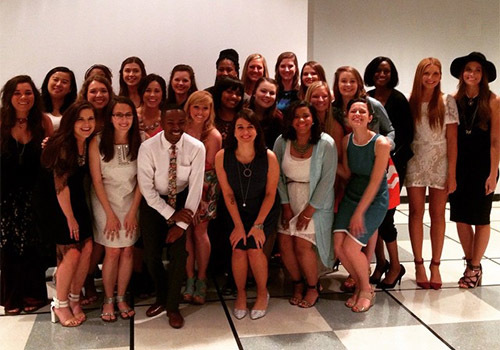 Graduating seniors from Mississippi State’s Fashion Design & Merchandising program. Because the partnership with Brooks and the bookstore was such a great success, Freeman wants to partner again for another class, Merchandising and Promotion Strategies. For this course, he wants to require students to create a promotional event centered on something at MSU – perhaps during football season. 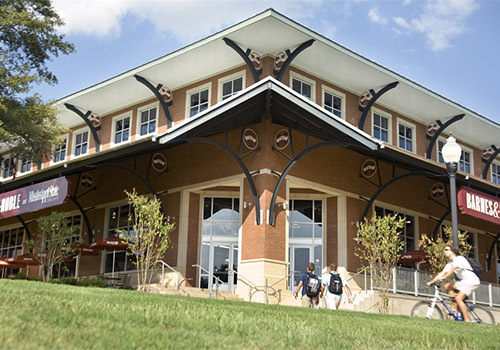 Much to his chagrin, Freeman discovered his students reported the bookstore was their favorite part of the class on the end-of-semester course survey. “I just can’t understand why they didn’t like my lectures better,” he says with a tongue-in-cheek laugh.